Mahalaya is an auspicious occasion observed seven days before the Durga Puja, and heralds the advent of Durga, the goddess of supreme power. 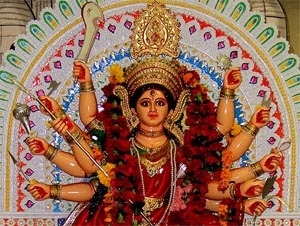 It is an invocation and invitation to the mother goddess to rise, awake and descend on earth and annihilate the evils of the world by her Supreme Goodness - Jago Tumi Jago, Jago Durga...This is done through the chanting of mantras and shlokas and singing devotional songs. The day of Mahalaya ushers in the aura of Durga Puja. The day of Mahalaya is also the day of Remembrance. On this day, people offer Tarpan in memory of their deceased forefathers. The banks of River Ganges in India are peopled with many priests seen busy performing Tarpan for devotees in groups. The rituals start from early dawn and last till mid-day. Devotees and worshipers observe a fast since morning and offer food, water, clothes and sweets to their forefathers. Thus, the auspicious Mahalaya day is religiously observed by performing this important ritual to remember our ancestors by doing the Tarpan in the names of those who were our near and dear ones but who are no longer alive with us today, though we cherish them in our hearts and minds. After offering Tarpan, people break their fast and have their first meal of the day. Mahalaya signifies the termination of Pitri Paksha and the beginning of Devi Paksha, thus ushering in the season of religious festivals. Durgotsav, as this festival is known in Bengal, commences from Mahalaya ' this is the day that Goddess Durga is supposed to begin her journey with her children from her husband Shiva's abode in Mount Kailash in the Himalayas to her parental home in the plains. On this auspicious day, early morning, at 4a.m. a 2 hour long program is broadcast in Bengali from Aklashvani Kolkata in India. A translated version in Hindi is subsequently transmitted from all other important radio stations of the country. 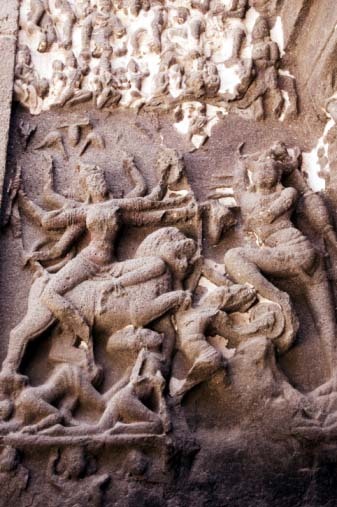 Titled Mahisasur-Mardini (which means 'the slayer of the demon-in-the-guise-of-a-buffalo') this program narrates why and how Durga was conceived, how she was armed with a plethora of weapons by the Gods to destroy the Buffalo Demon - Mahisasur who was causing havoc in the cosmos and how she achieved her goal by annihilating him and ushering in peace and happiness to the World. One man who'll always be remembered for making the Mahalaya Radio Program memorable to one and all is Birendra Krishna Bhadra, the magical voice behind the narration of Mahisasur-Mardini. This legendary narrator recites the holy verses and tells the story of the descent of Durga to earth, in his inimitable style. The program was first aired live on the radio way back in 1932. Birendra Krishna Bhadra was only 28 years old then. Birendra Bhadra has long passed away, but his recorded voice still forms the core of the Mahalaya program. In a sonorous, reverberating voice Birendra Bhadra renders the Mahalaya recital for two thrilling hours, mesmerizing every household with the divine aura of his narration, as the Bengalis submerge their souls in quiet moments of prayer. Mahisasur-Mardini is a remarkable piece of audio drama based on the Hindu mythology and the Vedic mantras of the Chandi-Path. The programme was first organised by Premankur Aatorthi, Birendra Krishna Bhadra, Nripendra Krishna Mukhopadhya and Raichand Boral. It is a landmark composition scripted by Bani Kumar, and narrated by Birendra Krishna Bhadra. The enchanting music is composed by none other than the immortal Pankaj Kumar Mullick, and the songs are rendered by famous singers of yesteryears - Dijen Mukhopadhya, Manobendra Mukhopadhya (Tabo Achinta'), Sandhya Mukherjee, Utpala Sen, Shyamal Mitra, Supriti Ghosh (Bajlo Tomar Alor Benu') Hemant Kumar and Arati Mukherjee. The renowned hero of the Mahabharata, Karna, after he had died and left his mortal remains on earth and ascended to Heaven, the great charity he had done on earth was returned to him hundred-fold. But, it was all gold and silver; there was no food, as he had not done any food-charity. He prayed to Yama - The God of Death to be sent back to Earth for 14 days, to make up for this deficiency. Lord Yama agreed and restored his life on earth. For 14 days, he fed Brahmins and the poor, and offered oblation of water. On his return to heaven after those 14 days, he now had access to food in plenty. It is these 14 days that are commemorated in the Mahalaya Paksha. Due to the grace of Lord Yama on Karna for having restored his life on earth for a fortnight, it has been ordained that offerings made during this period benefit all the departed souls, irrespective of they being connected to us or not. Charity in the form of food is important during this observance. Life sustains on food. One cannot preach religion and love to empty stomachs and starving souls. The human body is an important vehicle for realizing God. Food plays a very important role in keeping the body healthy and fit for Yoga and Meditation. The gift of food is the greatest gift of all. Therefore, one should give food in plenty, to the hungry and needy, not only during the Mahalaya fortnight but all through the year. Food charity is said to be the most benevolent of all charities and donations in the world as Food is a basic necessity for Human Life to survive on this Earth. I bow to thee, I bow to thee, I bow to thee.